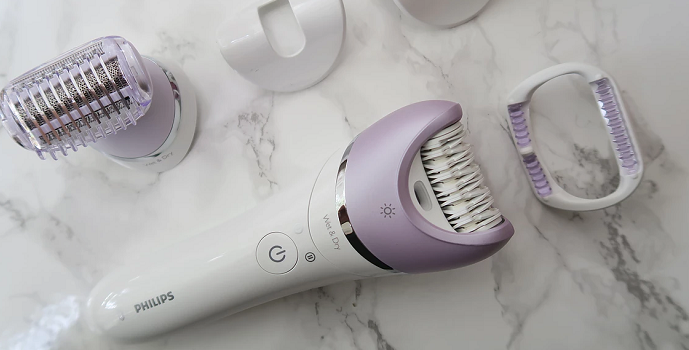 So, you’re looking to get your hands on a good epilator? But the problem is, two of the biggest grooming brands keep popping up and you’re at your wits’ end over which one to buy. I am of course talking about Braun and Philips epilators. More specifically, the Braun Silk Epil 7 (or Epil 9) and Philips Satinelle epilator. First-time buyers might be wondering which one they should go for, as both boast impressive reviews, and are field tested efficient hair removal tools. We’ve researched and reviewed both leading epilators in the past. Now it’s time for a side-by-side comparison of Braun and Philips best-selling epilators to see if there’s any significant differences, and to help you choose the right one for you. The first epilator, released to the public in 1986, was called the Epilady. It received public praise shortly after its release for its ingenuity in a field dominated by straight razors and electric shavers. It was the first hair-removal product to beat the razor in long-term results, while remaining easy to use. Philips, a leading beauty and personal care product brand entered the market in the late 1980’s with their debut epilator — the Satinelle. Around a year later, Braun — who would later become their largest competitor — released the Silk-épil, making their own way into the growing epilator scene. Since then, these rival hair removal giants have been battling for the top spot. Over the coming decades, epilators evolved greatly. What started with a primitive single-speed machine for plucking hairs, has now advanced into attractive machines with multi-speed wider rotating tweezer discs. Some of the advanced Braun and Philips epilators have attachments including an exfoliating brush, precision comb, relaxing massager, bikini trimmer, facial hair trimmer, electric foot Pedi, and electric lady shaver, offering users an all-in-one device for comfortable, superior hair removal and skin care at home. 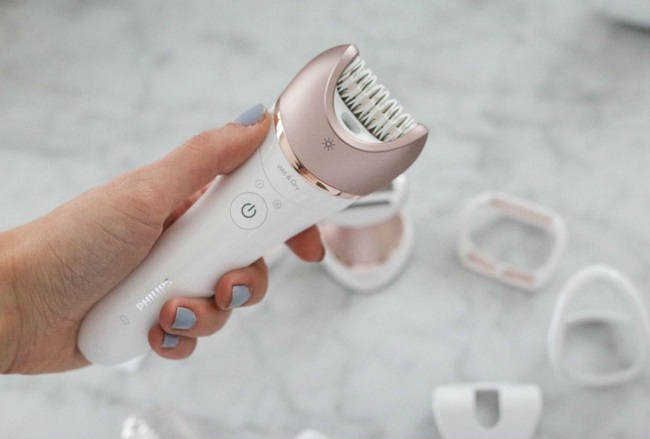 First, let’s talk about the Philips epilator. It’s only fair that we start with them, as they created their epilator before Braun. Philips Satinelle range of epilators has been going strong since 2003. Most of their older models have been discontinued. Not because they’re no good, but simply to make way for the newer, more advanced, and improved epilators you see today. Currently, Philips Satinelle start at the basic HP6422/02 “Essentials” model. 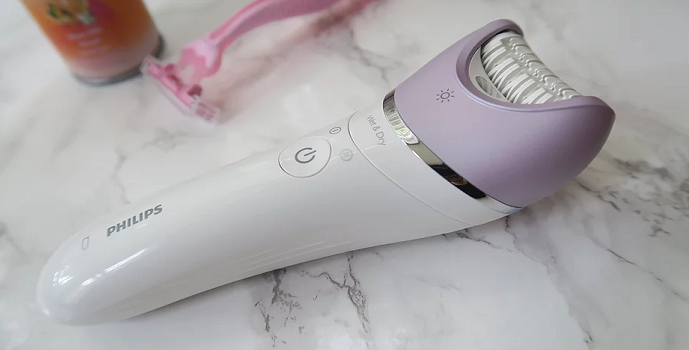 It’s a compact affordable little epilator priced around the £40 mark (as per the official Philips website) that gets the job done, without any fancy accessories. Philips have produced many quality epilators over the years, including the SatinSoft and SatinPerfect. But their most up to date flagship machines are the 2018 Satinelle models. Further up the ladder, you’ll find the Philips Satinelle Advanced and Prestige epilators with cordless wet or dry hair removal capability, and a bunch of welcomed attachments. Both the Advanced BRP535/00 and Prestige BRP586/00 models are identical epilators. The only differences being the accessories in the box – which varies, depending on the package. So, check the box and pick the model that has the most useful or appealing accessories to fit your needs. The Satinelle Prestige design manages to embody the elegance that a premium epilator should always bring to the table. With its colour combination of champagne and white, it would fit right in at Caesar’s Palace VIP suite. The Advanced model comes in a stunning lilac or soft blue and white, with silver trim. In fact, it’s such a nice design, that in 2016 it received an IF World Design Award. 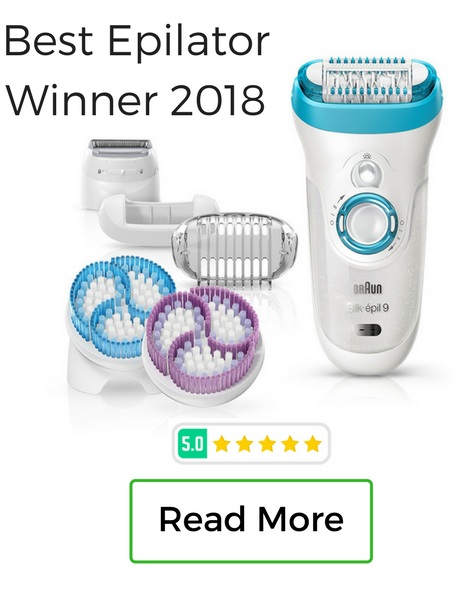 Since the Satinelle Advanced and Prestige are the current leading epilator models from Philips, I’ll discuss them and look at how they compare to Braun epilators. As you’d expect from Philips, this epilator is constructed to the highest standard. 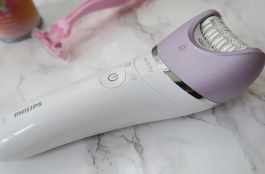 You might think that an epilator this robust and running high-end components would be quite heavy, but it’s actually one of the lighter epilators that we’ve seen, coming in at just over a pound. It’s very easy to use, and has a bright LED bulb, illuminating the smallest of hairs that you’d struggle to see under normal lighting. The elegant tapered handle and 30mm wide head removes hairs from a large surface area, while being easy to maneuver across your body, for effortless epilation. Simply pull off the epilator head with a little force, then click on your chosen attachment. Depending on what’s in your box, you’ll have different attachments. For example, the Philips Satinelle Advanced BRE635/00 comes with a shaving head. After epilating your legs, you might want to shave around your bikini line, or if you find epilating underarm hairs too painful, the electric shaver head would be the ideal attachment for more gentle hair removal. Its various attachments can accommodate the needs of any skin type. 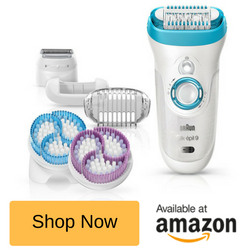 Typically, there’s two main heads – the epilator and the shaver. You have the option of using the basic cap with the head or making use of the massaging attachments for a home spa-like experience. The attachments help you style, trim, and shave your hair around the underarms or bikini line. The massaging and brush attachments help alleviate pain and exfoliate skin, which can help people with sensitive skin issues. The massager soothes and stimulates the skin to calm the pain receptors. Most tricky flat-lying hairs can’t escape either as the hair lifter gyrates the skin until those hairs have no choice but to rise up and meet their fate. The Satinelle Philips Epilator is switched on by clicking the power button once. A second push of the button slows the speed, and a third press turns the epilator off. If the intensity of the tweezers spinning at over 2,000 Revolutions per minute is too much for a sensitive area, it’s usefully to bring the RPM down a notch. Also, this is helpful if you’re just a beginner, and want to build up to a higher speed. The patented epilating discs are textured ceramic and hypoallergenic, making it very skin friendly with exceptional gripping power. The rougher texture of ceramic creates an anti-slip grip, for pulling the finest hairs. The Philips website states that it’s made with 32 independent, ceramic-textured tweezers — also referred to as “catch points” by epilator connoisseurs — that never miss a hair. You’ll noticed that the head has a slight dipped curve. This is to match the shapes of your body, because you’re never really epilating a perfectly flat surface. This design helps maximize surface contact, and therefor hair removal. With that said, it’s not like a magic wand where you pass over once and every hair is gone. It can take a couple of passes over the same area to fully remove ever hair. The epilation head is waterproof and therefor washable and even comes with a cleaning brush to remove lodged hairs. If you prefer to use the epilator exclusively in non-sensitive areas, you could use the shaving head for the rest of your body. It’s just as effortless and painless as regular razors. 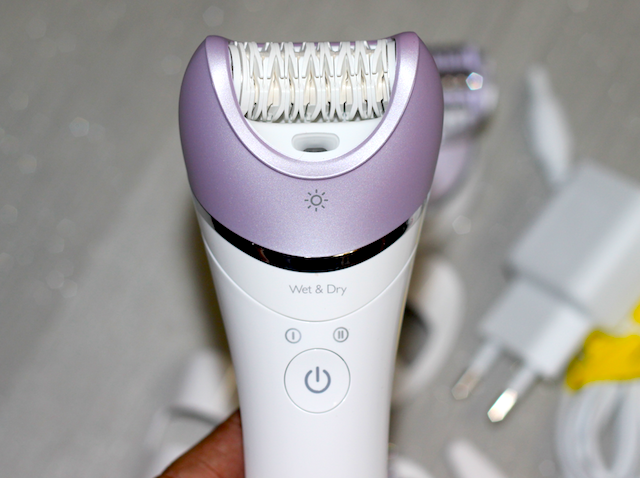 So far, we’ve painted a rosy picture of this Philips epilator. One thing – it’s rather loud. 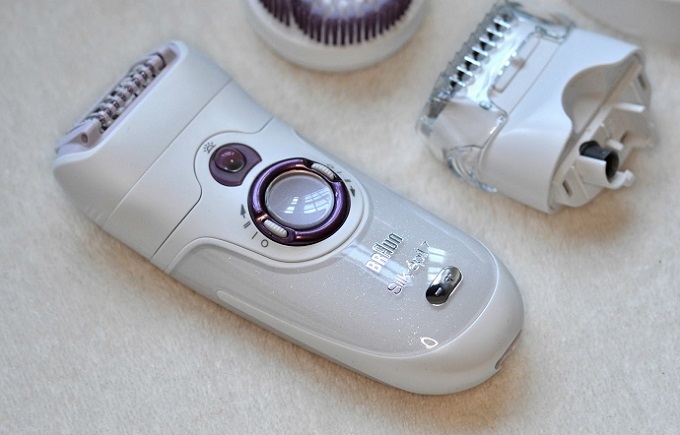 This epilator is not stealthy, it’s noisy – but so are most epilators. Now, that’s fine if you’re using the machine at a reasonable time of day / evening. I’d reconsider using this in the early hours of the morning, as this will wake the house. Users with sensitive hearing have found this Philips epilator unusable around the face and ears. Yes, you can epilate facial hair with the “facial area cap”. Make sure the epilator is fully, or well charge before using because it can’t be used when plugged into the mains. It’s for cordless use only. You don’t need any batteries, as it comes with a built in Lithium-ion battery and charger. It takes about an hour and a half to fully charge, and should you run out of power while epilating, there’s a handy 5-minute quick charge mode to get the job finishes. Ok, so we’ve established that this Philips epilator is a good investment. Now, let’s take a look at what Braun has to offer. The Braun Silk Epil 7 and Epil 9 are Philips’ top competing epilators. Braun has released the newer Silk Epil 9 (which is our top choice epilator) but the 7 is by no means obsolete. n fact, Braun recently made some upgrades to the Epil 7, including SensoSmart™ technology which alerts the user when they are applying to much pressure. A red LED light tells you that you’re pressing to hard, guiding you through optimal epilation. When compared to the Philips Satinelle, you’ll notice that the Braun Silk Epil isn’t quite as pretty. Sure, it’s a nice-looking epilator with glittery plastic and pink / cool blue colouring, but in our opinion, Philips wins on attractiveness. With that said, beauty is in the eye of the beholder, so you may like the looks of Braun over Philips. 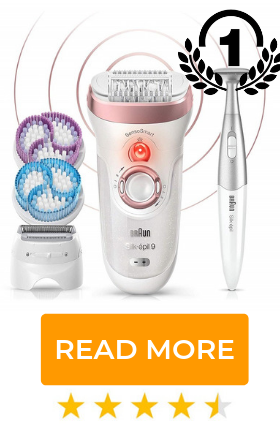 The Braun Silk-Epil 7 isn’t just a wet and dry epilator, it’s also a trimmer and shaver – an all in one easy to use ergonomic device. Just like Philips top epilator, the Braun Silk epilator range comes with a light to help you see those stealthy hairs that try to evade capture. Wet and dry for any situation. 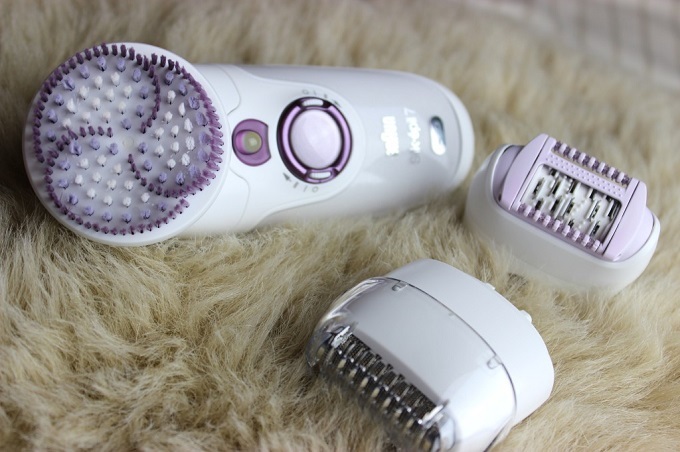 This epilator is cordless and is able to perform under both dry and wet conditions. Epilating in a soothing bath and using the Braun high frequency massager makes hair removal more comfortable and less painful. Standard 40 tweezers ensure a close grip for removal of even the smallest of hairs. So, no matter how evasive those little follicles are, the Silk Epil 7 will leave you silky smooth. The method by which this Braun epilator pucks hairs is with mechanical metal tweezer, which differs from Philips ceramic plates. In term of hair removal, both work equally well, though some say that Philips ceramic discs are more aggressive that Braun’s metal tweezers. One of the great things about Braun epilators is its range of compatible accessories to enhance its function. This unit is compatible with several attachments, which vary from model to model and can be purchased separately. The Epil 7 is a master of efficiency with its 40-tweezer technology that is capable of catching hairs as thin as half a millimeter! It doesn’t have the same inward curved head as the Philips, but it makes up for this with a pivoting head that helps you catch hairs on curved areas like your knees and underarms. The powerful battery allows for up to 50 minutes of continual use, with a simple (-) indicator when you start to run low on juice. A full charge can be accomplished in as little as one hour plugged in. Like the Philips epilator, this Braun elip range are waterproof. It’s best to use these machines in the shower, or just after bathing because dry hairs can get flicked and scattered around. It’s better to have shower or bath water to contain and wash the hairs away. In terms of noise, this machine is about as loud as the Philips model. Epilators have a lot of spinning and moving parts, which produces sound – it comes with the territory. At the time of writing this post (13/08/2018) the Philips Satinelle scores 3.3 / 5 stars and Braun Silk Epil 7 scores 4.2 / 5 from customers on Amazon.co.uk. This score puts Braun slightly ahead of Philips when gathering feedback from real users. Both the Braun Silk Epil 7 / 9 and the Philips Satinelle Advanced are both great epilators – they deliver. However, more people report that hairs are broken instead of plucked by the Philips epilator, but this could be down to user hair type. Fine blond hairs are more prone to breaking than coarse dark hairs, so it could be coincidental, as most people don’t encounter this issue. More users seem to find the Braun epilator captures more hairs than Philips over a single pass. This could be Braun’s new SoftLift Tips® at play, it’s part of the tweezer system that guides flat laying hairs to the tweezers for maximum lift and pluck. The inward curved head of the Philips Satinelle Advanced and Prestige is great for legs and arms, as this epilator almost hugs the surface of the skin, but this curved shape makes areas like underarms and behind the knee very difficult to reach. The flat epilator head makes underarms and tight grooves easy to epilate, making it better for overall hair removal across the whole body. Braun also has SensoSmart™ pressure sensor which means you’ll always be applying optimal pressure – a feature unique to Braun.